Hello Thursday - the third one of the month. Before we know it, February will slide by in just a few more days. A couple of days ago, to work, I wore this Winter White Cardigan which is Embellished with a Black Flower+Leaf thingy and the Black piping detail. I paired it with these Dressy Herringbone Trousers. Both of these items had been ignored for so long and I am glad they are back in action. They are pretty and classic pieces that should No Longer be Neglected. The Cardigan is with 3/4 sleeves and is a pretty short length style-wise, so I layered with my Black (thin) Turtleneck underneath. This Black Turtleneck has been a closet staple for me, this Winter. I added a Sparkly, Silver Necklace, some Dangly Earrings and my Brown Oxford Wedges for a Monochrome appeal. This outfit is perfect to link up today with Jacquelyn, because the Spotlight Weekly is Winter White. Also, Audrey challenged us this week to wear something we have neglected for over 6 months. Have you neglected anything nice lately? 3/4 Sleeve, Ivory/Winter White Cardigan w/ Black Embellished Flower Detail & Black Ribbon Trim (Around the Collar): White House Black Market (bolero option, embellished, love this), (textured knit option, open-style, great deal, love this), (classic crew-neck option by J. Crew), (gorgeous option w/ embellished neckline by Target, best deal, love this). Black+White, Wide-Legged, Classic Herringbone Trousers: Express (similar, on sale), (similar by Liz Claiborne, best deal, love these), (gorgeous option by Express, great deal, love these). 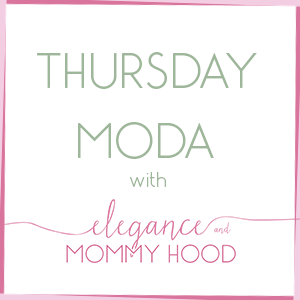 Below is how I last wore this Cardigan (at least from what is documented on the blog). It was in May 2013 and Vivian was only 3 and a half months old. Considering that today she is exactly 25 months old, that is forever ago. I love this outfit below though. It's worth a repeat, what do you think? P.S. 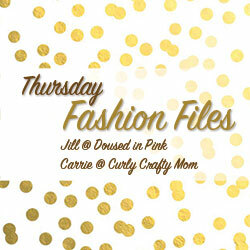 I am linking up today with a new link-up called Thursday Fashion Files, once again co-hosted on Thursdays by my Beautiful Friends and Awesome Mommy Bloggers CARRIE from Curly Crafty Mom and JILL from Doused in Pink. These ladies do it all: from crafts, to DIY's, to shopping, to style posts. Their blogs have a little bit of everything and they are daily reads of mine. Join them today, they are so sweet! I am also linking up with Aisha, Alice, Dawn, Jalynn, Lauren, Linda, Miriam, Rachel, Tara and Vicki.